(CNN) - Sen. Bernie Sanders of Vermont says his brand of liberalism could serve as a "damn good platform" to run for president. In an interview posted Monday to ABC/Yahoo News, Sanders, an independent who aligns himself with the Democratic Party, said income inequality is at its highest point in over eight decades - and the American people are ready to elect someone who's able to close that gap. "You have today in America more income and wealth inequality than any time in this country since 1928 and more than any major country in the world. So you have the top one percent owning 38% of the wealth of America," he said. Asked by interviewer Jeff Zeleny, ABC’s senior Washington correspondent, if that's a stake a potential White House hopeful could run on, Sanders said, "Yeah. I think it's a damn good platform." Sanders is openly considering a run for president in 2016 - and he isn't without some backing. As the Vermont senator travels around the country, some progressives see him as an opportunity to steer the party further to the left. A small group of Iowans recently created the "Draft Bernie Sanders for President" committee to urge Sanders to run for the Democratic nomination. Asked about that support, Sanders said: "“Look, it's easy for me to give a good speech, and I give good speeches." And what about Hillary Clinton? The former secretary of state and senator from New York is currently the overwhelming 2016 favorite among Democrats. 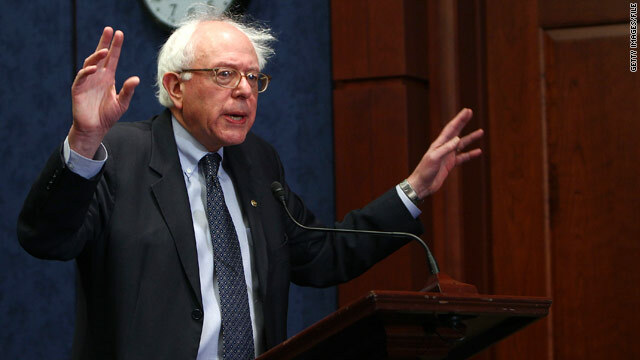 Sanders, who served in the House before being elected to the Senate in 2006, threw cold water on the idea that his former colleague is the prohibitive nominee. With a population of 626,630 of which 1.2% are African-Americans, how in the world does the city of Vermont rate two U.S. senators? How do the 7,519 African-Americans in Vermont feel about Comrade Sanders? Here's another shining example of the right wing's delusional and outright ignorance of simple facts. We had George McGovern, who had no chance, then we had Jimmy Carter, who lasted one term, now we have Barrack Obama who finally got a second term and now you want to continue all the failures of the past now on the front burner. Income Inequality you say? Well Bernie, the liberal's have been running things the last 100 years so why do we have Income Inequality? Why isn't everything fixed by now. What happened? Sanders is more for the Middle Class & in line with the Message of Jesus Christ as found in the Four Gospels than ANY Repub. So throw your labels all you want. So you, Bernie Sanders and the Democrats want to steer the country into a leftist Christian Theocracy? What ever happened to the separation of church and state with you lefties? Or do you just use religion to con people when it is convenient? As the Vermont senator travels around the country, some progressives see him as an opportunity to steer the party further to the left. This is what I have been saying all along. The Democrat Party is an extreme far left party that wants to socialism and communism, not capitalism. Progressive is a name they use because nobody would vote for them if they called themselves what they are, socialists and communists. Wake up America. Today’s Democrat Party is NOT the party of JFK, it is the party of Karl Marx and Lenin. To think that socialism to some degree was not instrumental in building the middle class is to be completely ignorant of history. Why can't we debate the faults of capitalusm? If anything the past 40 years of trickle down have only highlighted it's shortcomings. But in the fascist GOP world questioning anything that may hamper the ability of corporations to rake in record profits is Unamerican and should be dismissed without a second thought. This directly opposes the idea of promoting intelligence, something our founding fathers felt was of great import. The fact is he's just average-left. Yes, Fidel Castro was average left as well. But he's going to find it hard to make any progress witthin the centrist Democratic establishment. Not true. The Democrat Party is stocked full of socialists and commies just like Bernie. Look at how many want Warren. That will give you a good idea. WUP.... ..."GOPT is right of the Taliban." With a statement like that, you might be as crazy as this guy looks...........and thinks. sonny crapman -St. Ronald Reagen let that genie out of the bottle when he embraced"Christian" Conservative/Moral Majority Pat Robinson & THE Rev. Jerry Falwell. Now that Faith has become part of the American Political Scene, Repubs are STUCK with the Words of Jesus, as given to him by the Father & transcribed in the very exact Greek Language. Hard Words for ALL to follow, Dem. or Repub. What happened? We let Republicans have control of the White House and the Congress for nearly a decade and they crashed the economy....again. Just like they did back 1929, when they had ad control of the White House and the Congress for over a decade. Tommy G – Executive Orders. Obama ... Blah, Blah, Blah "
It is so easy being a rightie these days: just take any topic and turn it into a rant against Obama. It would be pointless to explain to you how many Executive Orders w-cheney enacted. How they choose which environmental laws were unworthy of enforcement. If you didn't hear it on the right wing propaganda network, it didn't happen. You had Jimmy Carter who held the title for years as the worst president until Barrack Obama came along. If Bernie Sanders runs and wins; he will easily take the worst president title away from Barrack Obama. News flash... Wealth inequality has sky rocketed since Obama took office. While his dismal economic policies have kept unemployment at record levels, decimating the middle class, his endless printing of money has driven the stock market high and into a bubble. The higher income levels benefit greatly from a high stock market while the unemployed middle class falls behind. Thanks Obama! Now claim it is all Bush's fault. Rla, we agree we can't afford more trickle down economics, now all you have to do is figure out who's tax plan follows that ideology, hint, look right. only problem with your posting is that it is a lie rudy. democrats controlled both the house and senate 2006-2008 and lead us right into the recession. warning after warning about subprime mortgages being dangerous, nothing done. barney frank, looney leftist democrat said all was well, nothing wrong, no problem. nice try but we gotcha! If Little Bush had accomplished anything, like the death of bin Laden, RWNJs would be demanding he be put on Mt. Rushmore, next to Cliven Bundy. However, unnecessary wars off the books, tax cuts for the wealthy, and being white are W's accomplishments. Run Bernie run, and thank you sir for sponsoring the bill to help veterans like myself. The worst Presidents in recent years were Republicans, and that includes your Hero Ronald Reagan. George w bush July 2008, the economy is fine, its still going strong, you got who? Hate to burst that bubble but they tried Socialisim in the Old Soviet Union. It was such a Smashing Success it thrives in North Korea, maybe dying in Cuba. Who wants to Re-Invent the Soviet Union. But with all the Liberal Policies, put in place to keep the 1930's from repeating itself we are, you guessed it, returning to the 1930's, for a second go around. Keep up the good work Rudy, your side is still winning.